There was a giant snake (daija or orochi, 大蛇) living around the 586 metres high Abu-yama (阿武山) in Aki province (present-day Hiroshima Prefecture) which frightened the local population. According to eyewitnesses, the body of the snake stretched over eight valleys and its belly was that big that it could easily swallow an entire elephant. Its eyes were flashing, the teeth sharp, and there were flames coming from its mouth when breathing out. The lord of this fief, Kagawa Mitsukage (香川光景), was concerned about the welfare of his people but what worried him more was that a rebellion could arouse when he remained inactive. So he gathered all his sons and retainers to consult on ways and means to kill the giant snake. One relative of Mitsukage – some sources say he was his younger brother – at this gathering was the only 18 years old Kagawa Uemonnodaiyū Katsutaka (香川右衛門大夫勝雄, 1515-1569). Katsutaka was fearless, with 6 shaku and 8 bu (~ 1.84 m) very tall, coarse facial features, and despite his young age a wild goatee which made him look like Shōki (鐘馗),*1 the mythological Chinese demon queller. “I have killed some men. That´s easy. But to kill a demon or a tengu,*2 that would be the right thing for me!,” boasted Katsutaka who tried to make a name for himself with killing the giant snake. Mitsukage replied: “Well, than I assign this task to you, esteemed Katsutaka. Give me a proof when you have succeeded in killing the snake which is already owning large areas of my land.” With these words he handed him over a treasure sword which was handed-down within the Kagawa family for generations: a 3 shaku 1 sun (~ 93.9 cm) measuring ō-dachi of the swordsmith Yoshimoto (吉元). There are several theories about this smith. One say he was the son of Yoshifusa (吉房) who was one of the outstanding smiths of the Fukuoka-Ichimonji school. Other records say that he was the adopted son of Sukeyoshi (助吉) who in his turn was the founder of the Yoshioka-Ichimonji school. Thus the dating of Yoshimoto is unclear too, ranging from Ryakunin (暦仁, 1238-1239) over Kōan (弘安, 1278-1288) to Shōwa (正和, 1312-1317). The snake awoke, saw Katsutaka, and immediately sprayed her poison. Gone blind the young warrior staggered around but was able to crawl to a spring where he and his horse had quenched their thirst shortly before they came to the rocky ledge. He washed his eyes and attacked the giant snake and after a short fight he decapitated her with his giant tachi. But the snake was not immediately dead because the head rose up into the sky to come down again on Katsutaka with its blazing flames. “Not enough for you?,” he yelled and gave the head such a massive blow that it fell some hundred meters away into a rice field. The furrow the giant snake head teared open when it reached the ground was later locally called Jaōji Gorge (Jaōji-buchi, 蛇王子淵, lit. “Snake-Prince Gorge”) and since then it was told that the spring as magical eye-curing powers. The sword was offered to the family shrine of the Kagawa, the Mitsuhiro-jinja (光廣神社) of Aki´s Yagi village (八木). However, the whereabouts of the sword are unclear because it is no longer existant in that shrine. But the name jakiri-maru appears also in another context. In the northern prefectures of Yamagata and Akita, thus quite close to Iwate and Aomori, people tell the story of the brigand Ogachi Tarō (雄勝太郎). It is assumed that he got his name Ogachi from the pass of the same name for which he charged a toll. An interesting sidenote: When we reverse the two characters, we get Katsutaka´s first name (勝雄). However, except that he took road tolls, the brigand was not a bad egg because he also took care of the safety of the pass road and the area as a whole. But to the south of this pass near the village of Nozoki (及位), a member of his band of robbers did his mischief. This man had the same name as the sword mentioned before, namely Jakirimaru. This annoyed Ogachi very much because he actually tried to get along with the local people. Ogachi invited all his men to a huge banquet under the pretext to share out some “revenues” but at the height of the party he decapitated Jakirimaru whereupon all other attendees fled. The sword which he took from the dead robber was with 3 shaku and 3 sun (~ 100.8 cm) even longer as the blade of Yoshimoto and he gave him the name of his previous owner, Jakirimaru. It is unclear under what circumstances the blade went into the possession of the Takahashi family (高橋), but there, it was handed down from one generation to another under the name Kanemaru (金丸). The word ja (蛇, snake) is chiselled with an old, unusual character (虵) whose outgoing last stroke on the right side is executed like a snake. Also kiri (切) is executed with a different left-standing radical (干 instead of 七), but such variations in notation were not uncommon at that time. 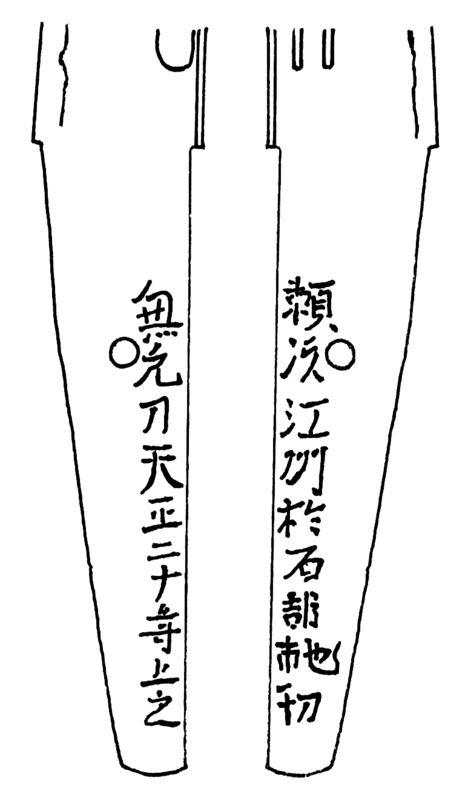 The addition kore o agaru (上之) means “this was shortened” and is another way – usually the term suriageru (磨上げる) is used – to describe the shortening of a blade. Yoritsugu refers probably to Toki Yoritsugu (土岐頼次, 1545-1614). *3 The Toki were once the military governors of Mino province but when Yoritsugu´s grandfather Masafusa (政房, 1457-1519) died in the 16th year of Eishō (永正, 1519) this office called Mino–shugo was succeeded by Saitō Toshinaga (斎藤利良, ?-1538). After Toshinaga´s death and inmidst the turmoils of the Sengoku period, Saitō Dōsan (斎藤道三, 1494-1556) expelled the Toki clan including Yoritsugu from Mino. Dōsan himself was before a retainer of the Toki family. As a result, Yoritsugu became a vassal of Matsunaga Hisahide (松永久秀, 1510-1577) and later uma-mawari-shū (see here) of Toyotomi Hideyoshi. In the year 1587 he was granted by the latter with lands in the Furuichi district (古市) of Kawachi province (present-day Ōsaka Prefecture) which had an income of just 500 koku. Now there are basically two opportunities how Yoritsugu could have come to Ishibe. First, it was the 20th anniversary of his father´s death Yorinari (頼芸, 1502-1582) in Tenshō 20 (1592), the year which is mentioned in the signature. His grave lies in Kire (岐礼, Gifu Prefecture) in Mino province and so it is possible that Yoritsugu passed Ishibe on the way from Furuichi. Another possibility is Hideyoshi´s large-scale survey (taikō-kenchi, 太閤検地) which reached Ōmi province just one year before. It could be that Yoritsugu was posted away as low-ranking vassal Hideyoshi´s in some function as surveyor to the mountain range of Ishibe. Interestingly, Saitō Dōsan´s nickname was “The Serpent of Mino” (Mino no mamushi, 美濃の蝮) but this has of course nothing to do with Kanemoto´s wakizashi. After Hideyoshi, Toki Yoritsugu served Tokugawa Ieyasu and sided with him at the Battle of Sekigahara. Afterwards he was promoted to the rank of hatamoto (旗本), a so-called bannerman in the direct service of the Tokugawa bakufu. And Ieyasu even presented him with the famous sword Shishiō (獅子王, lit. “Lion King”) to which the following legend exists. According to the Heike Monogatari, emperor Kaiser Konoe (近衛天皇, 1139-1155, r. 1142-1155) was once frightened by a creature which flew over the imperial palace every night. He called for Minamoto no Yorimasa (源頼政, 1104-1180) who deal with that problem. In one of the following nights Yorimasa and his men sat in ambush in front of the palace when a dark cloud moved in. Yorimasa saw something in it and – with swearing that he commit suicide when failing at this task – shot straightaway an arrow into the cloud. But he hit the strange creature which turned out to be a so-called nue (鵺), a legendary chimera which is described having the head of a monkey, the body of a tanuki (狸, racoon dog), the legs of a tiger, a snake (or a dragon) as a tale, and a cry like a White´s Trush (toratsugumi, 虎鶫). Still alive the nue felt down to the ground but was finally killed by Yorimasa with nine sword strokes. For this heroic deed Emperor Konoe granted him with the above mentioned sword with the nickname Shishiō. However, it is unclear how the sword came to the name Lion King and how it came later into the possession of Tokugawa Ieyasu. After the latter handed it over to Yoritsugu it became a treasure sword of the Toki family which presented it at the end to Emperor Meiji. Today it is designated as jūyō-bunkazai and preserved in the Tōkyō National Museum. The accompanying mounting whose leather hilt wrapping is unfortunately lost, dates to the late Heian, early Kamakura period (see picture below). *1 Shōki (鐘馗, Chin. Zhong-kúi) was an ugly physician from the T´ang-era (618-907). He aimed at a career in the government and underwent all admission tests, mastering them with flying colors. But when he was introduced to the emperor, he rejected him because of his ugliness. Of shame he killed himself right in front of the emperor at the steps to the imperial palace. Conscience-stricken the emperor ordered a ceremonial funeral for him and in gratitude to that, Shōki´s soul pledged that he will protect all Chinese emperors from evil spirits and demons. *2 (天狗) A mythological, supernatural creature in Japanese folklore with human and avian characteristics. *3 By the way, his mother was the daughter of Rokkaku Sadayori introduced here.